I wrote about coconut butter a couple months ago and used it for homemade peppermint patties. Update: I am not over my coconut butter kick….I think I’m making up for lost time not knowing about it. So if you’re into it as much as I am, this recipe is for you! This hot cacao drink tastes exactly like the York Peppermint Patties! -Soy and almond milk: These are great alternatives to cow’s milk as they’re easier for the body to digest and less inflammatory. I love organic soy milk because it contains protein and calcium (soy milk gets a bad wrap, but if you buy the unsweetened organic version, you avoid all the negative jargon about it! Soy in certain forms can be great for your health. -Cacao: Using cacao, vs traditional refined baking cocoa, increases your antioxidants which are powerful in fighting disease. -Coconut Butter: Coconut butter is high in vitamins and minerals, and it contains antibacterial properties to support your immune system. By adding a healthy fat to meals and snacks, you increase nutrient absorption, satiety (feeling full and satisfied longer), reduce blood sugar crashes, and support brain and digestive function. Sign me up for that! -Raw Honey: Raw honey is full of antibacterial and anti-fungal components. If you buy a local version, you’ll also benefit from it’s allergen fighting properties. -Peppermint Oil: Some people experience a relief in abdominal pain, bloating, IBS, and nausea when ingesting peppermint oil. Be sure you buy from a high quality source that you trust when purchasing essential oils to ingest. 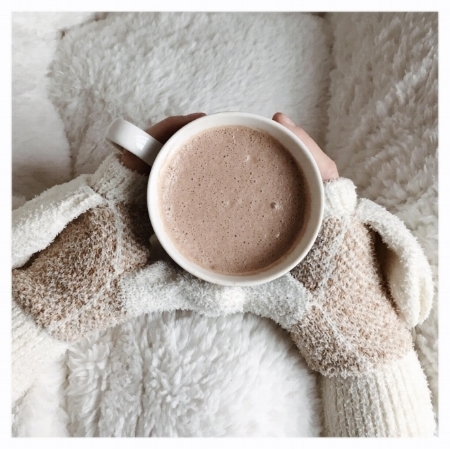 Are you a hot chocolate fan? Is there a special way YOU like to make it?? Tell us in the comments below!